I'm a definite latecomer to the Morganville Vampire books by Rachel Caine. But after reading all 15 last month, I am without a doubt obsessed. This series is more amazing than I could have imagined and easily one of my all time favourite series. Believe me, I understand how a fifteen book series would come across as intimidating. You would think it would have to go wrong somewhere, right? But each book continues to deliver and please. Because I love this series so much I thought I'd write a post all about it. My hope is that by the end of this you'll be going straight to the store and buying yourself a copy. 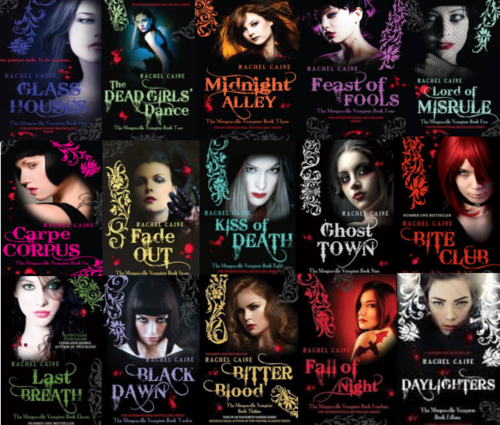 Why you should read The Morganville Vampires series? BECAUSE IT'S THE BEST VAMPIRE SERIES OUT THERE, DUH! : Being a fan of Vampire books, I think it's pretty safe to say that, that's a big statement. But I truly believe it's the best Vampire series YA has to offer. It's so cleverly crafted, well thought out and original! Even if you despise books about Vampires, this is so massively different from the rest that you'll just fall in love with it. It really does stand out from your typical Vampire book on the market and I honestly think it's the best this sub genre has. AWESOME BUNCH OF CHARACTERS: Morganville has such cool residents. I just adore the Glass House bunch! Our main character Claire is independent, intelligent and practical. She's normal without being boring and she just seems to stand out from a selection of the heroines in Young Adult today. The Glass House Bunch; Shane, Eve, Michael and Claire are just so perfect. Because they are flawed, caring, brave and hilarious. I could write paragraphs on each and everyone of them because I'm honestly so attached with the characters in this series. We even have awesomely written bad guys, town leaders and crazy genius vampires *cough* Myrnin *Cough* who wear fanged bunny slippers. Characters I will not easily part with. OH AND THIS BOOK CONTAINS MY OTP! IT'S ONE HELL OF AN ADDICTIVE READ: Each book is page turning to say the least. I read all 15 books after each other because there was always so much happening, plot twists on every corner and of course the cliffhangers. It's almost impossible to be bored whilst reading a MV novel. CONSISTENTLY DELIVERING: I honestly don't understand how Rachel Caine manages to pull off 15 books. Each with an exciting plot and continuation of the one before hand. Like I said before, there's always something happening around the corner. Fifteen bloody books and by the end I feel as though I could easily and very happily read fifteen more. In fact I demand Rachel Caine get onto that right now. For about a month all I could think about was this series and I would read book after book. It was like my second home and I was happy having it that way. Before I started this series I thought it being a 15 book series and all, would be a serious turn off. But I am so out of this world happy that Rachel Caine wrote as many as she did. I feel as though 15 wasn't enough! No amount will be enough! Ok maybe 40 would be a bit much but you get what I mean.. SUCH AN EASY AND REAL READ: There's something about Rachel Caine's writing that's so down to earth and engaging. I feel involved in the stories and as you can imagine, after 15 books.. I feel pretty connected to all of the characters. Even with crazed vampires looming around town, Rachel Caine still managed to make me laugh! Anyway I don't think I've done it justice but at least know you know some of the many reasons why this series rules! Please do check it out and tell me what you think and if you have read it, then come and fangirl over Shane with me. Daylighters, the last one, was a awesome conclusion and I'm really sad to see it end. I'm definitely not going to stop thinking about this series anytime soon. In fact I'm already planning a re-read. But yeah, I highly recommend this series. I really want to read this series but 15 books....dayum! That will at least take up a months reading. I would have to make sure I have read all review books and have absolutely nothing to read. There's always the whole of next year. Rachel Caine is one of my favourite authors of all time, but shock horror - I haven't read this series yet! (her other books are awesome enough to reel me in)! Thanks for these reasons, I need to kick start this series! I've been wanting to read this series for a while now and this post just made me even more excited, I hope to read it soon! LOVE this post! It really captures a fangirls attention! I adore it when you become completely enthralled in a series and you just need everyone to read the novels in it - I love the feeling I get when I know I truly fell for a series. Hard. It rarely EVER happens on such a scale! I love this series. I've read 13 so far. They're great, but they aren't better than Vampire Academy.